Where it went down Under darkened skies, deep in the Ardennes countryside. F1's penultimate European event, and the longest circuit on this year's calendar. Top takeaway Mercedes squander an easy one-two as management lose control and drivers call the shots. The Belgium weekend was a roller coaster of emotions. Thankfulness that Formula One returned to our screens, confusion that a wet qualifying session couldn't deliver more of a shake up than it did, hopefulness that someone/anyone could get the better of Mercedes on the day, and then awe at the race as it unfolded. It may not have been the perfect Grand Prix, but it certainly delivered plenty to talk about. Here are some of the things that may have slipped under the radar. 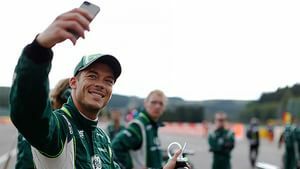 You just have to feel for André Lotterer, who came in for plenty of criticism when he was first announced. Why was he pushing Kobayashi out of a seat? What experience did he have? What claim to the Caterham drive? As the race day approached, it became more obvious that he could hold his own. Qualifying went well, he outclassed Marcus Ericsson putting to good use his skills in changeable conditions. Lotterer's race lasted only a couple of laps before his car gave up beneath him. He was naturally disappointed but looked very calm and professional about it on the long walk back to the pit lane. I didn't even get to sweat unfortunately. I was really looking forward to a good race and I had a good start, but then I went a bit wide at turn 17 and there was a sudden loss of power. Renault are looking into what happened to the power unit, but do wonder whether it was hitting a kerb too hard that caused the engine to cut out. Either way, it was a sad end to the weekend for the German. Now that the race is over and he barely got a chance, most of the criticism has disappeared and all that's left is an empathy that his opportunity was cut short. It's very similar to Susie Wolff's chance at Silverstone, that came in for plenty of discussion beforehand but was ultimately cut short by mechanical issues. Maybe we should try waiting to see what happens before over-reacting about things. Or maybe it's more fun the other way. It emerged ahead of the race in Spa that Sebastian Vettel would be losing his right-hand man, race engineer Guillaume Roquelin, as of next year. The well-known voice will be moving on to a more senior role within the Red Bull team, leaving Vettel to become accustomed to a new advisor. Reportedly, Gianpiero Lambiase will be switching from Force India and his current role as race engineer for Sergio Pérez. It can't be easy for drivers to change race engineers, particularly if it's a voice they've been used to for a long time, and one that's guided them to great success. We know Felipe Massa's radio relationship with Rob Smedley had to come to an end when he moved to Williams, although the Brit followed the driver to his new team. When switching outfits, you have to deal with a new voice over the radio, but if you're not changing teams, it must be quite unsettling. It can't do Vettel too much harm though. He's struggled throughout the season to get comfortable in the car and has only just started to look on par with new teammate Daniel Ricciardo. Perhaps a new motivational speaker might be just what he needs. After the first few races, I think we all thought the Mercedes pair would be pretty much untouchable at the top of the championship standings. And so far they have been. The team are waltzing away with the constructor's title, and it is currently Nico Rosberg leading Lewis Hamilton in the driver's fight. However, Daniel Ricciardo's third win of 2014, this weekend in Belgium, has allowed the Red Bull driver to move within arm's reach of Hamilton - creating a more interesting battle for second place. Hamilton's bad luck has manifested itself over the past few races, giving the smiling Australian a chance to catch up. The table on the right shows the points gap between second and third place, and it's clear that there was a blip in Germany, but things are moving in the right direction for Ricciardo now. It's the closest at this point than it has been since before Monaco. The full championship standings with added graph also has a good visual display of the Red Bull's rise to be in sight of the top two drivers. It seems almost unbelievable that Ricciardo can continue this good form and actually join the fight towards the top of the table. Fernando Alonso certainly thinks it's a tough ask, saying: "Obviously he's doing an amazing job and he's surprising everyone, but the Mercedes advantage... in qualifying they were two seconds clear. But if any of the rest can do it, at the moment it's only Ricciardo." On the other hand, the Mercedes pair are doing their best to scupper each other's chances without really looking at what's going on behind. It wouldn't be the first time Hamilton was too focused on Rosberg in front to worry about a distant Ricciardo hurriedly closing the gap! In a tweet One botched manoeuvre puts Mercedes on the brink of war. We'll be talking about that one for a long time to come.